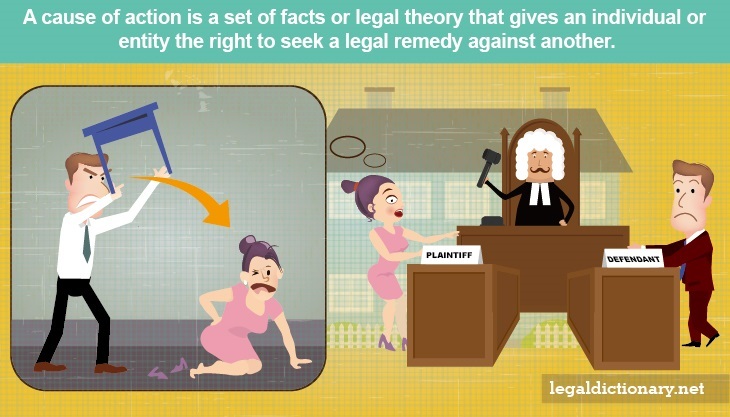 In the legal system, a “cause of action” is a set of facts or legal theory that gives an individual or entity the right to seek a legal remedy against another. This applies to the filing of a civil lawsuit for such wrongs as property damages, personal injury, or monetary loss, as well as to criminal wrongs such as battery, theft, or kidnapping. A cause of action may come from an act or failure to act, breach of duty, or a violation of rights, and the facts or circumstances of each specific case often have a significant effect on the case. To explore this concept, consider the following cause of action definition. noun. A condition under which one party would be entitled to sue another. noun. A set of facts that, if true, entitle an individual or entity to be awarded a remedy by a court of law. The document that is filed to begin either a civil or criminal matter in the court system is called a “complaint.” In the complaint, the person bringing the matter to court, either the party wronged in a civil action, or the prosecuting attorney in a criminal matter, outlines the alleged facts of the case, any theory by which alleged actions are wrong or illegal, as well as the relief sought from the court. It is common for the facts of a case to create more than one cause of action, each of which is addressed in the same complaint. When an individual or entity is being sued in civil court, a copy of the complaint will be served with the Summons on the defendant. The defendant is then required to file a written response with the court within a specified time limit, usually 30 days. The defendant should respond to each cause of action or accusation in the complaint truthfully and politely. The answer should include any legal defenses or counterclaims the defendant wants the court to hear. It is important to contact the court to learn the specific format and information required on the front page of the answer, and that the answer be filed with the court when complete. Whether accused of a crime or being sued in civil court, it is wise for the defendant to consult an experienced attorney who can guide them through the legal process, and help ensure his rights are protected. Civil lawsuits may be as simple as a complaint that a debt has not been repaid, or as complex as an issue of personal injury in an accident which involved multiple parties, or an accusation of fraud in a real estate or business transaction. An attorney can help navigate these complex legal waters much less perilous. Quantum Meruit – an order for a reasonable sum of money to be paid for services rendered when a specific amount is not stipulated in a legally enforceable contract. Material Representation – a persuasive or influential statement made for the purpose of inducing someone to enter into an agreement or contract to which the person would not have agreed without the statement.